Much has been written on crimes against the Rohingya people in Rakhine state, Myanmar, but muted are the issues swirling round the genocidal activity of the Myanmar military. 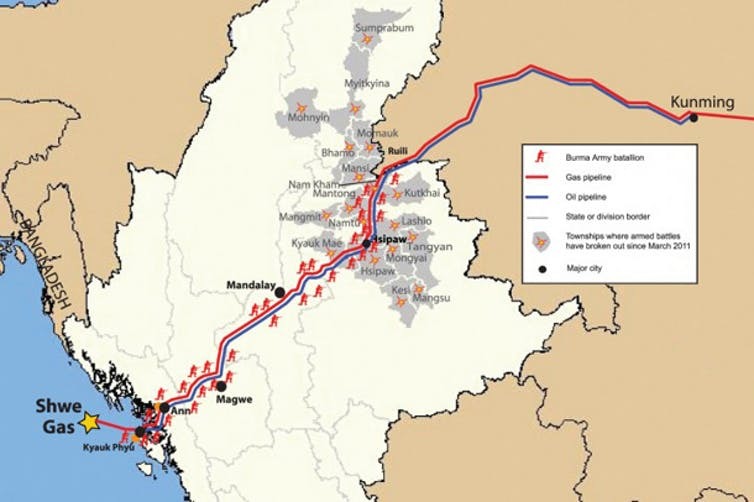 Much has been written on the Rohingya refugee camps around Cox’s Bazaar, Bangladesh, but there has barely been mention of refugee concentration camps ringing the oil and gas installations owned by the China National Petroleum Company some 250 km to the south. Vindication for this infrastructure is China’s concern for the security of oil supplies from the Middle East through the Malacca Strait choke point. Also, there was concern over the long haul through the Indonesian archipelago and the South China Sea. Recently, Indian submarine activity has been detected in the Malacca Strait approaches. Considering the fraught situation between India and China in the Himalayas, China’s program seems justified. Placing the violence in Rakhine state into context, it must be recognised that there are vested powerful economic interests involved. Land-grabbing in Rakhine and globally is endemic when major infrastructure projects are planned. In 2011, Myanmar enacted political and economic reforms to encourage foreign investment in the country. Shortly afterwards, in 2012, violent attacks against the Rohingya commenced concurrent with Chinese and Korean interests acquiring timber, mineral and agricultural assets in the region. In 2015, the Myanmar government revoked the citizenship of many Rohingya ensuring forced removal could be facilitated. The silence of Aung San Suu Kyi is understandable. The current violence in Rakhine is not simply due to ethnic or religious animosity. This ethnic cleansing is generated by a desire for economic and industrial development. In previous decades all industrialised countries have forcibly ‘relocated’ or killed indigenous people to further their own economic or strategic imperatives. Unfortunately Myanmar is in the 21st century’s spotlight. Developing nations in the 19th and 20th centuries, however, have been able to develop their economies prior to the instant news cycle. 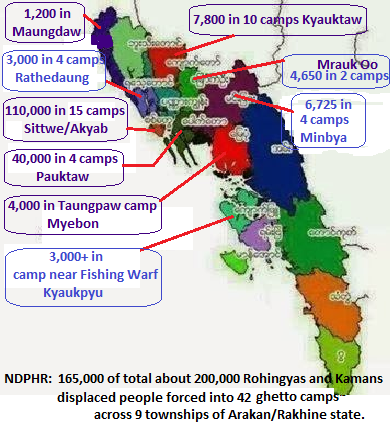 This problem cannot be solved by Aung San Suu Kyi or General Min Aung Haiang, Chief of Armed Forces. There are about 1.1 million Rohingya – nearly half must be in Bangladesh or Myanmar refugee concentration camps. If the International Community will not provide relocation then the situation might subside into silent exhausted hatred, with the rump of the Rohingya moved away from valuable coastal areas. At a ‘working’ lunch in New York on the 18th September 2017, the Australian Foreign Minister spoke on the violence in Rakhine. (Parliament of Australia Briefs) Condemned in equal amounts were the ARSA attacks on police posts and the military for their attacks on the Rohingya. The Minister noted “something was wrong and called for a cessation of hostilities”. (Naive in the extreme!!!). The Minister further noted that Australia had donated $65 million to alleviate suffering. (Little is solved by only throwing money at a problem!!!) All good motherhood stuff, but it was a speech of no moment. There was no mention of unrest due to foreign investment, dispossession or environmental damage. There was no suggested solution; a capitulation to an inevitable. Unfortunately our ‘national’ hands are tied. Australia can say nothing to jeopadise our coal, iron ore and tourism exports but Australia must, perforce, inevitably permit a perceptible colonisation of Australia’s higher education instituions. As Napoleon Bonaparte famously noted: “China is a sleeping giant. Let her sleep, for when she awakes she will move the world”.